A reality show in which two families, usually of different social classes, swap wives/mothers for a week. For some, it’s a dream vacation; for others, it’s a nightmare come true. Each family is awarded $50,000 at the end of the week, with the stipulation that the guest wife/mother has to decide how the host family will spend the money. Occasionally, husbands/fathers were swapped instead. There are no current plans to revive the show. • In April 2003, Chappelle’s Show featured a sketch called “Trading Spouses,” over a year before the FOX show aired. The sketch was based on the home-decorating show Trading Spaces and Dave Chappelle’s stand-up comedy. 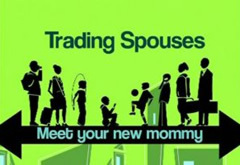 • Though Trading Spouses debuted before ABC’s Wife Swap, it was given a greenlight a month after ABC’s presentation of Wife Swap to advertisers. Producers of Wipe Swap claimed that Trading Spouses producers stole their idea and filed a lawsuit against them in December 2004. The parties reached an undisclosed out-of-court settlement in February 2005. • Trading Spouses was not given a spot on FOX’s Fall or midseason 2007-08 schedules but is listed among their returning programs.